We are thrilled the Girl Scouts have decided to take an active roll in encouraging girls to pursue STEM learning. More and more jobs are requiring at least some coding experience and the early students are exposed to coding the more comfortable they are with it. Women are still underrepresented in STEM jobs and we aim to change that by introducing STEM lessons to girls at a young age so they see these jobs as a viable option. 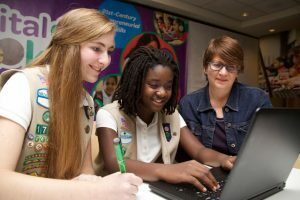 Girl Scouts provide a unique platform to expose girls to STEM in a comfortable, friendly environment and we couldn’t be more honored to help them in their journey. 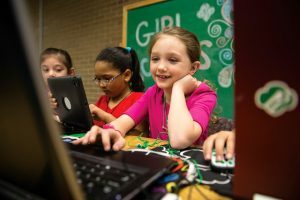 comfortable trying new things, taking appropriate risks,and learning from failure.” Code Ladder is proud to be working with area Brownie and Girl Scout troops to help them earn new technology badges. Want to get your troop involved? Take a look at Our Classes and Contact Us to find out how Code Ladder can help your girls with their STEM journey. Want to help us reach more girls and give them the opportunity to explore coding? Consider donating today! Code Ladder is a 501(c)(3) dedicated to giving every student the opportunity to learn to code. We provide underserved populations with free coding classes and offer low-cost classes to all other schools, groups, and organizations.